One way to get a closer look at a reef manta rays on the Big Island is to take a ride in a glass bottom boat. One leaves from the Kailua-Kona dock and goes to either behind the Sheraton or behind the airport, whichever place poses the best opportunity for the mantas to be present. Drinks and a simple snack are available, and the trip is a smooth opportunity to see the Kona coast at night. 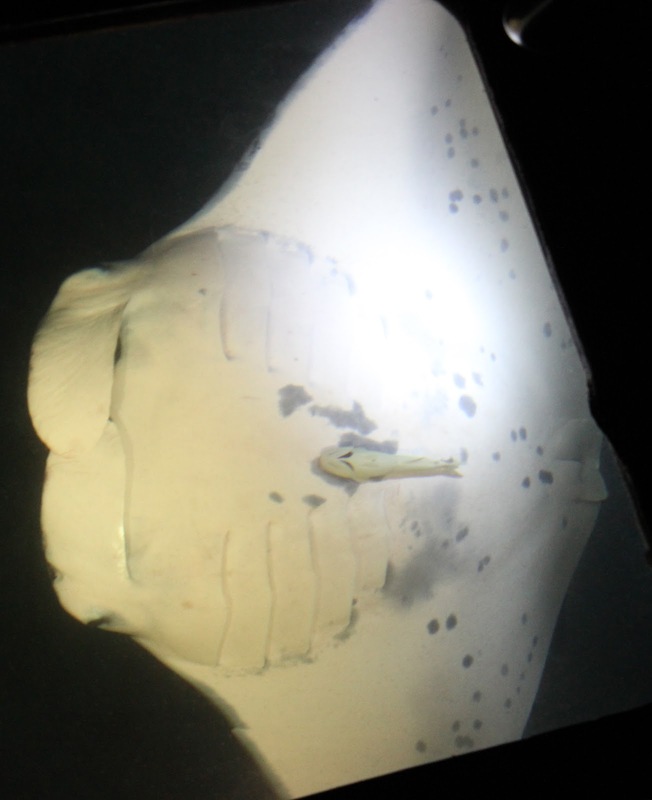 For those not comfortable snorkeling with mantas at night, the glass bottom boat is a good way to see the mantas. One unexpected treat for us was when the crew turned off their underwater lights. We were amazed at the sight of all the glowing critters. As the boat scoots through the water, it agitates the little bio luminescent creatures causing them to show off their phosphorescent attributes. That was cool and the first time we'd seen anything like it. Reef manta under the glass bottom boat. On our trip they stopped the boat in 12-feet deep water over a sandy bottom near the Sheraton. Not too long afterwards, a manta ray arrived swimming under the keel of the boat to feed on the concentration of plankton attracted by the ship's lights. It swam back and forth and did what is called barrel rolls, but what a pilot would call a backwards loop. There may be one or many mantas. It is a beautiful sight. The underside of a female reef manta with an attached remora. ﻿﻿﻿﻿While the best way to see mantas requires getting wet (yep, that means night snorkeling), it was met with a little bit of timidity from some members of our group. Snorkeling is good, but at night? With big animals cruising around you in the dark? We built up to the night snorkel with mantas by visiting the Sheraton to see the mantas and taking this glass bottom boat first. The glass bottom boat with its bright lights bouncing off the white sand only 12 feet from the surface made a manta night snorkel seem doable.